 There's mayhem on the high seas and on the waters of the Thames in British naval historian Eccles's novel; fires, floods, fistfights, and French bullets are easier to overcome than pesky rebels stopping up London's lifeline. Midshipman John Lawson is good Captain Brewster's 18-year-old pet, a paragon of honor and loyalty aboard the Adamant, a British naval ship loaded with corruption and skulduggery. It's 1797, and the Adamant must defend His Majesty George IV's fair shores against invading French troops. En route from Liverpool to Brest, France, the big gunner encounters and joins forces with a friendly Russian racing sloop, but camaraderie becomes chaos when they sight land and the waters swarm with warmongering ``frogs.'' Readers will be as confused as the players in the ensuing skirmish: Who's on whose side? The Adamant's bickering bank of indecisive officers, consumptive ex-convict sailors, thieves, and traitors flee, switch boats, and fight with encroaching enemy troops, spies, and one another in a frenzied maritime free-for-all. Thank goodness the women aren't hurt! Women? That's right, before the embroilment a Russian aristocrat and her two daughters had left their sloop for the comfy and civilized Adamant. Their presence introduces social niceties to naval crisis; between battles the men find time to throw birthday fetes for charming daughter Victoria and engage in jaunty competitions and jealous rivalries over her. But our hero Lawson's her guy; they vow to be together right after he squelches a mutinous uprising in the Thames with now-beleaguered mentor Brewster. Eccles handles historical details with aplomb, but he founders in the deeper waters of big-picture overview and personal relationships. 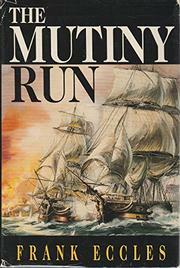 The headlining mutiny is a footnote, the Lawson/Victoria romance strictly dime-store paperback material. Myopic nautical adventure for initiates only; bring your own glossary.